On the first day of the new year, Debbie Livingston went for a walk with her two children, three-year-old Shep and baby Dahlia, three months. If you didn’t know Debbie Livingston, you might assume that she went out for a stroll (literally, pushing a stroller) around the streets of her Connecticut neighborhood. But Debbie is an outdoors mom. She and her husband, Scott, and several friends had rung in the New Year in New Hampshire’s North Country. On the first day of 2010, while Scott attempted a winter hike of Mt. Adams and Mt. Madison, Debbie and a friend decided to hike along the Old Jackson Road, which is part of the Appalachian Trail and offers views of Adams and Madison. Shep would have a friend along as well, a two-and-a-half-year-old boy. It had been snowing for two straight days, was snowing still, and would snow for two more. On the Valley Way trail, Debbie’s husband and his climbing partners would find the going slow. Debbie checked the temperature before she left Joe Dodge Lodge: in the mid-teens. This might sound like the set-up to a tragedy. But the two mothers had plenty of experience, a good plan, and a comfortable, safe transportation system. At Joe Dodge Lodge, the mothers belted the two toddlers into the seats of sleds called pulks. “Pulk” is a Scandinavian word that comes from the Sami, reindeer-herding people who live above the Arctic Circle and who’ve refined the design of snow sleds over many centuries. The moms put snacks and drinks for the little ones within easy reach in side pockets. Debbie strapped Dahlia, who is several months from sitting up, into a hammock-style sling next to her brother. A vented plastic cover protected the children from the elements and gave them a front-window view of the action. 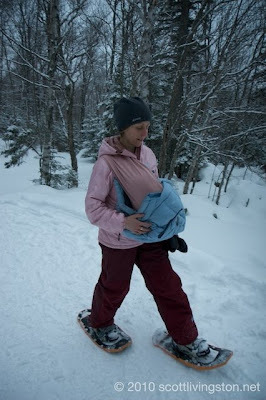 The children settled, the two women then strapped on snowshoes and buckled themselves into pulling harnesses. Rigid poles kept the carriers and their cargo a constant distance behind the moms, leaving enough room for snowshoes or skis. In pulling a sled, the hardest step is always the first. After Debbie got her 70-pound load moving, the runners slid easily over the packed snow, although the two women occasionally needed to help each other lift their pulks over rocks or push them through tight spots on the trail. Debbie, who trains for ultra distance trail-running, started running with Shep in a child-carrier from the time he was six weeks old. (The Livingstons use the same carrier chassis as a running stroller and a pulk, popping off the wheels to attach sled runners.) She learned to time her workouts around Shep’s naps, and now does the same for Dahlia’s. The motion of being pushed in the stroller or pulled in the pulk seems to induce a mellow drowsiness in both children, and they rarely fidget. She also doesn’t push their limits: The first outing of 2010 lasted a little less than two hours, and mothers and children spent a pleasant afternoon back at the lodge. The two boys watched snowplows through the window, played in the Discovery Room, and ran the hallways. The men? They made it to the summit of Mt. Madison in a stiff wind and blowing snow but turned around in deteriorating conditions before reaching Adams. 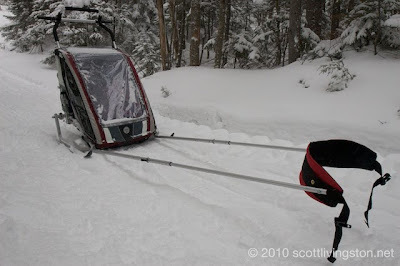 General information about ski sleds from a cross-country ski website. Information about the Chariot CX-2, the brand that Debbie Livingston uses. Read Scott Livingston's blog post about the Mt. Adams and Mt. Madison climb. Photo credits: Scott Livingston. Debbie Livingston carrying Dahlia. The Chariot CX-2 ready for action.